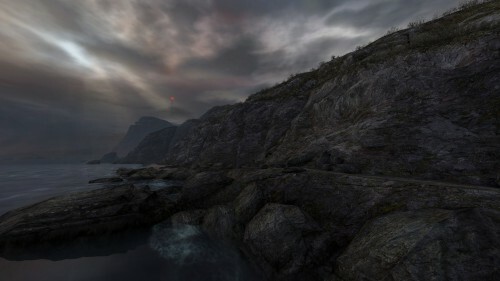 Dear Esther, created by The Chinese Room and available now on Steam, was released in 2012 and received much critical acclaim, winning ten major awards in 2012. Despite the large amounts of praise received, Dear Esther originally had humble beginnings starting as a source mod back in 2007, before later being remade in 2012. The remake included extended versions of fantastic contributions to narration and music composition from Nigel Carrington and Jessica Curry respectively. The Chinese Room have created a refreshing, indie experience in a similar vein to the likes of Gone Home. Dear Esther tells a much darker story than that of Gone Home and through lines of prose that suits the melancholy tone that runs throughout the game. The narration is nothing short of brilliant. The delivery of the lines is what solidifies this as such a memorable experience and the whole thing is tied neatly together with well polished visuals. Though these visuals are nothing ground-breaking, they still leave you feeling like you are exploring a real life island with all of its beautiful scenery and views. This does not mean that the game is going to be admired and appreciated by everyone. 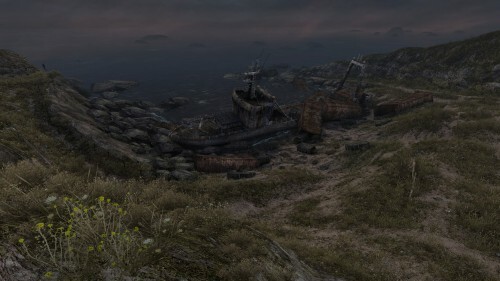 In fact it’s difficult to class Dear Esther as a game, it’s more of an interactive story which, whilst other games wow you with explosions, fast cars and equally fast paced action, Dear Esther wows you with its artistic approach to every single aspect of its creation. There are no objectives, nothing to collect and nothing specifically to do; just walk, listen and admire. Literally all that is used for controls in this game is the standard WASD and mouse movement and the occasional left click to zoom in on the environment if you so choose to. The relaxed nature of Dear Esther is a kind of double edged sword, whilst it’s lovely to walk around and admire all of the island, in particular the caves and its beautiful waterfall, the lack of the ability to run or increase the speed that you’re walking can be seen as a pain and seems like it wasn’t put into the game solely to stop you from rushing through it. However I can sympathise with this viewpoint to an extent; rushing through the game and missing out all of the little easter eggs would go against the calmness at the heart of the game. 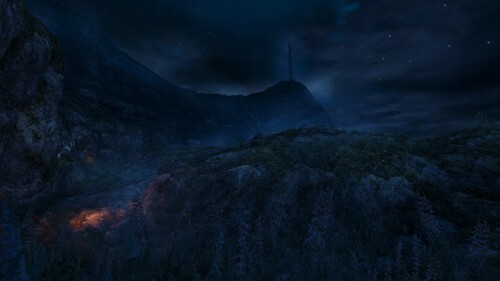 The story of Dear Esther itself is a bit of an odd one, you’re dropped onto the shore of the island and make your way to a radio tower, on the way your character, narrated fantastically by Nigel Carrington, addresses Esther, who I can only assume is your characters deceased wife. Though I won’t say any more to avoid ruining the game, the further you progress the more of the story unfolds and those strange markings all over the walls may not seem quite as strange when looking back after finishing the game. One of the best parts of the storytelling is how Carrington has been able to capture the changing emotions of your character as he recalls the story and the journey he seems to have already made before. Each section of the game, separated by the unfortunate though short loading screens, almost carries a different feeling to it, the caves in particular are a real turning point in the game and my own personal favourite. These load screens are one of my few issues with the game, being so deeply immersed in the whole experience, only to be yanked out of it by a black screen with white blinking bubbles 4 separate times. In an experience that will take you just over an hour to finish this was disappointing and felt like further work on the game could have avoided this. Though these loading screens do occur frequently when the length of the game is brought into context, all of this was forgotten at the waterfall in the caves. The sound of crashing water from waterfalls, the dripping of water droplets onto rocks and the brilliant scores of classical music accompanies one of the most breathtaking and one of my personal favourite ever views in a video game to date. In fact, on this review playthrough, my third time playing Dear Esther, I still found myself standing admiring the waterfall and the sound for a good 5 minutes before proceeding in the game. You know a game has hit on something special when it makes you take your hands off the controller or mouse and keyboard and just stare in awe. But with what may seem like a game, drowned in depression and misery, full of beautiful scenery and fantastic musical composition, comes a final section of prose from the narrator bringing the whole game full circle in its emotional roller-coaster. This game will be etched into your memories for one reason or another, and so it should be. Dear Esther delivers an experience that, when you’re tired of fire-fights, car chases and expletives, is a breath of fresh air, calming music and beautifully created environments to explore at your own leisure. If games can be described as art, then this is its definition. This entry was posted in Uncategorized and tagged Dear Esther, Gone Home, Indie, Jessica Curry, Nigel Carrington, PC, Steam, The Chinese Room, Video Games. Bookmark the permalink.